Cannabis tax in California would generate 1.2 Bil.$ a year! California — Here’s a sure sign that marijuana dispensaries are on their way to becoming big business: On July 13 the city council of Berkeley, Calif., asked voters to approve a 2.5 percent tax on the city’s marijuana outlets, three of which grossed a total of $19 million last year, all cash. “This is huge,” says Mayor Tom Bates. 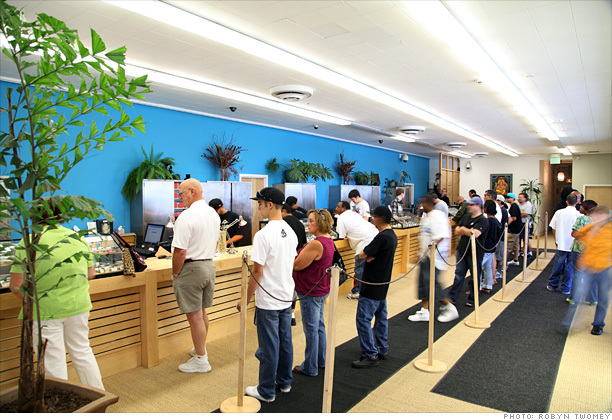 A dispensary in Oakland, Ca. The “war on drugs” finally flickered into the election campaign last weekend. You might expect it to be one of the biggest issues, since – along with the United States – our government is the most hawkish drug warrior in the world. Using the institutions of the United Nations as their proxy, they are trying violently to suppress a $500bn-a-year industry that makes up 8 per cent of all global trade. Whole countries – from Afghanistan to Colombia – are being destabilised as they try to “eradicate” drug supply.